A group of Central American migrants, representing the thousands participating in a caravan trying to reach the U.S. border, undertake an hours-long march to the UN's humans rights office in Mexico City, Nov. 8, 2018. United States President Donald Trump said on Friday he has signed an order to deny asylum to migrants who enter the country illegally. “We need people in our country but they have to come in legally” Trump said. He spoke as he was leaving for Paris to attend observances of the 100th anniversary of the end of World War I. The president signed the order as groups of Central American migrants travel to the U.S. border with Mexico. Many are fleeing violence in their homelands. It is not known if the large group plans to illegally cross the border. The American Civil Liberties Union, or ACLU, and several other rights groups immediately brought legal action against the order in a federal court in California. ACLU attorney Lee Gelernt said Trump’s order ignores immigration law passed by Congress to provide asylum to those in danger. The U.S. Immigration and Nationality Act says a migrant is permitted to make a claim for asylum up to one year after arriving in the U.S. The law does not set a condition on how they arrive – illegally or through a border crossing. Officials from the Trump administration said the order is meant to force asylum seekers to go through official border crossings. The legal ports of entry along the southern border already have long lines of people. 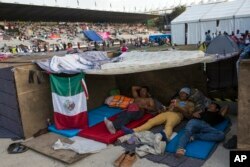 Central American migrants rest at the Jesus Martinez stadium in Mexico City, Tuesday, Nov. 6, 2018. In 2017, the U.S. received more than 330,000 asylum claims. That number is the highest in the world and nearly double the number from two years earlier. Additionally, U.S. immigration courts have a list of more than 800,000 claims that are being considered for approval. Officials said people who are denied asylum may be permitted to receive a similar form of protection if they fear returning to their countries. But they would be subject to higher requirements. The protection is called “withholding of removal.” It does not permit migrants to receive green cards or to bring family members. Officials estimated that about 7,000 Central American migrants are in Mexico heading to the U.S. They are mainly poor people and many say they are fleeing violence. It is estimated that 1,700 are children under 18, and more than 300 are children under age 5. Hai Do adapted this story for VOA Learning English a report by the Associated Press. Mario Ritter was the editor.